A wedding is not complete until your guests have received favors to commemorate your special day. This week on American Bridal, save on our unique favors including coasters, chocolates, and favor holders. Our spotlight goes to these charming candle lanterns. They add elegant ambiance to your wedding reception tables, casting a soft, romantic glow on the night! The perfect accent for any celebration, these beautiful candle lanterns are imminently suitable for weddings, engagement parties, and bridal showers, creating a cozy setting when grouped on tables. We love the idea of allowing your guests to take home these miniature candle lanterns as tokens of your thanks! Your guests will smile with memories of your special day each time they light these lovely candle lanterns. See more beautiful paper decorations and reception accessories on sale here. *Coupons and sale prices valid through Sunday, June 23rd 2013. 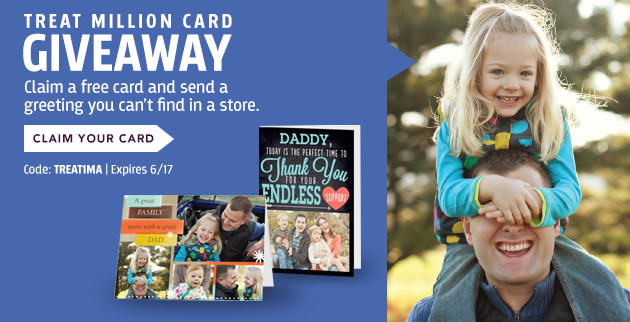 Treat is giving away 1,000,000 greeting cards this month!. From now through June 17th 2013, any new customer to Treat can get a free card for any occasion absolutely free. 1. Check out their selection of thousands of designs designs and choose your favorite card. 2. Upload pictures, choose your font and message, and preview the card to make sure it's right..
3. Use promo code TREAT1MA when you checkout.